Exposure compensation is a term used in photographic technology and Exposure Compensation in Digital Photography is the process of consciously correcting the exposure value, which the automated metering of the digital camera wrongly calculated and made (or will probably make) image brighter or darker than the expected result. The unit of exposure compensation is exposure value (abbreviated as EV). 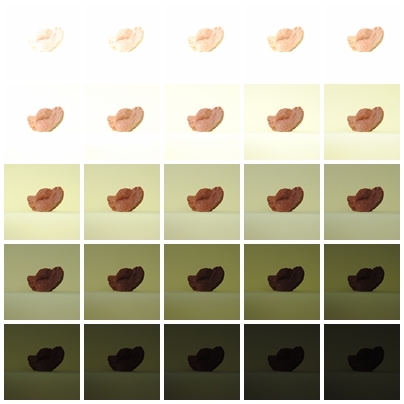 Exposure Compensation can be manipulated on camera or off camera on computer using any advanced photo editing software like Adobe Photoshop. If you are a beginner, a good article to start will be the article on Exposure. Exposure Compensation follows is no standardization of the automatic exposure equivalent. The usual range set on most camera is -2 to +2. Normally, it is at zero. That is, in zero Exposure Compensation is not overridden. Negative value makes the image darker and positive value serves the opposite action. Why the button of Exposure Compensation is universally present on almost all cameras ? Image : Fantastic demonstration of each step of Exposure Compensation by Miss K of atozphoto.wordpress.com in the post Day 16 “ Exposure Compensation. DSLRs specially of entry level, practically has been closer to point and shoot camera. In older days, the Exposure Compensation had a big value in SLR film photography. Exposure Compensation was used to test the chemical emulsion or the negatives quality to determine the difference from the printed ISO rating. As in digital photography, we can actually change a big factor – the ISO number (that was not possible if the negative film roll was not changed inside the darkroom). Moreover, manual setting of shutter speed and aperture has been more accurate. Another point is, if the format is image RAW (or digital negative, dng), we can edit the Exposure Compensation more accurately on the computer as the size of screen is quite bigger than the camera’s LCD panel and more precise movement can be done. So to keep the tradition, the Exposure Compensation dial is universally present, for mobile phones, sometimes Exposure Compensation is the only way to make the image brighter or darker. High Dynamic Range (HDR) Image and Photography is a digital image that can save the naturally occurring differences in luminance detail. Basic target of High Dynamic Range (HDR) Image is not only creating stunning surreal photograph. Image Resolution and Pixel Count in Digital Photography is an important topic it is not really the optical system but the sensor which deteriorates the image. Cite this article as: Abhishek Ghosh, "Exposure Compensation in Digital Photography," in The Customize Windows, July 3, 2012, April 21, 2019, https://thecustomizewindows.com/2012/07/exposure-compensation-in-digital-photography/.